Its results are “no less than astounding.” Here’s why. IT’S NOT OFTEN that a grower comes across a piece of new equipment that can give a full return on investment in one year and can reduce their farm’s impact on the environment. 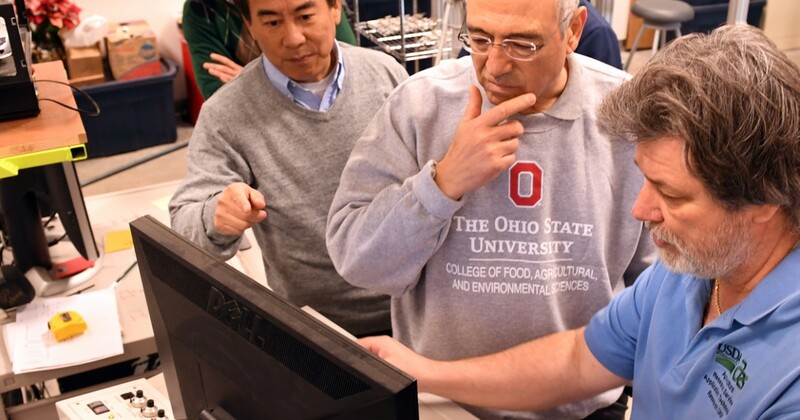 But a device developed by researchers from the U.S. Department of Agriculture (USDA) and The Ohio State University’s College of Food, Agricultural, and Environmental Sciences (CFAES) is promising just that. Their “intelligent sprayer” is the first automatic spraying system of its kind in the world. 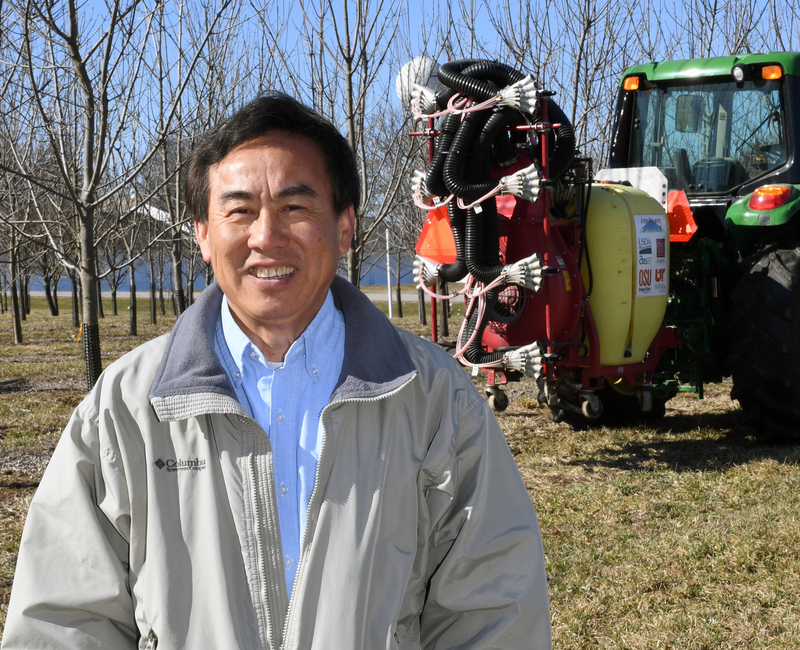 “Using conventional sprayers, growers simply turn on the sprayer at one end of the row of trees and stop spraying at the other end,” said Erdal Ozkan, professor of agricultural engineering in CFAES’s Department of Food, Agricultural and Biological Engineering (FABE). “We are still using the same type of sprayers designed more than 60 years ago. Heping Zhu poses with the sprayer in the background. 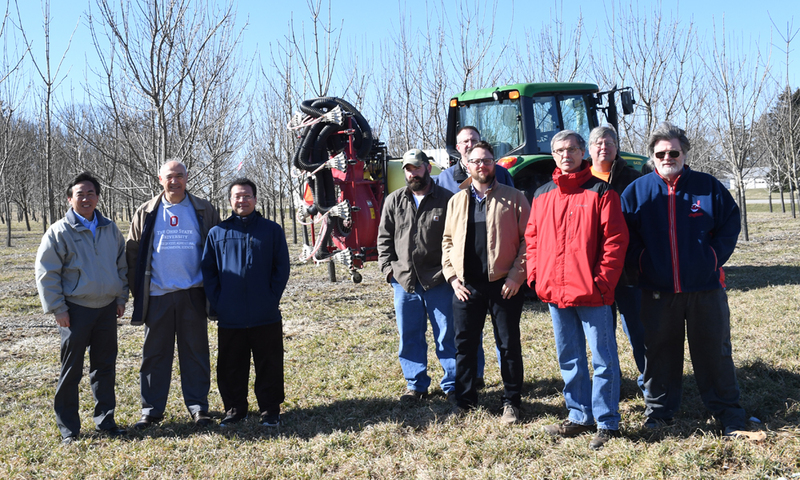 The intelligent sprayer development and testing team represents a collaboration between CFAES, FABE, CFAES’s Department of Entomology and the USDA-Agricultural Research Service (USDA-ARS). Using high-speed sensors and computing technology, this team of researchers is bringing pesticide application into the digital age. Lasers detect the tree canopy around the sprayer, and an algorithm developed by the team determines the optimum level of spray to be emitted by each of the sprayer’s 40 nozzles. While the system can run automatically as the sprayer moves through the field, the operator can also manually control the system through a built-in touch screen. reduced pesticide use by more than 50 percent. All this, and the intelligent sprayer showed the same level of pest control as a conventional sprayer. By reducing spray drift, loss and chemical usage, the new sprayer can save growers time and money. The sprayer development team, from left: Heping Zhu, Erdal Ozkan, Luis Canas, Adam Clark, Mike Klingman, Christopher Ranger, Michael Reding, Andy Doklovic and Barry Nudd. The team is also working to develop an intelligent sprayer kit that can be retrofitted onto almost any sprayer, which would reduce the additional expense to utilize this new technology. The intelligent sprayer has received several recognitions, including a national award from the American Society of Agricultural and Biological Engineers and the 2018 Innovator of the Year Award from CFAES. Manufacturers also have expressed interest in this new technology and how it can be adapted into their own sprayer designs. Growers who’d like to help test and evaluate the sprayer, and manufacturers interested in exploring ways to produce sprayers with intelligent features, should contact Zhu at heping.zhu@ars.usda.gov.